What's the caste composition of India? The recent controversy over reservation has once again opened the lid off India's caste cauldron. So, what is the percent of OBCs (Other Backward Castes) in India's population. The figures range from 40% to as high as 52%. In fact, it is also possible that the OBCs could number around 40% of Indian population. In some regions, the backward castes are landed communities and influential but have little presence in government jobs. As per ancient system, except Brahmins, Kshatriyas and Vaishyas, all the others are Shudras [almost 90% of India's population]. The Shudras include all OBCs, Dalit [SC], Scheduled Tribes and intermediary castes. 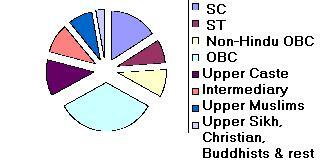 In the pie chart, Upper Castes includes Brahmin, Kshatriya and Vaishya etc. 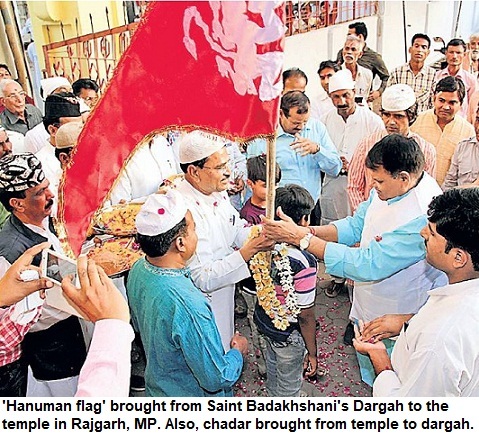 The non-Hindu OBCs include Muslims. The intermediary includes Hindu castes of Jat, Reddy, Patel and Maratha (as per their status in various areas). 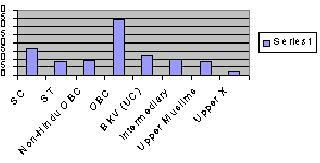 The Upper Muslims are non-OBC and non-ST while the rest include upper Sikhs, Christians, Buddhists and rests. Is this distribution or caste composition correct? I don't know, frankly. The 14.2% Muslims are thus divided as per their castes in this chart. So are the OBCs most numerous in India? I was recently reading an article published in a weekly paper about the by-poll in an assembly constituency. It was stunning to see the detail of caste configuration to which they had calculated, in order to understand ground realities as how caste cohesiveness works in elections. They had mentioned each and every group that even constituted over 1% of the population. There were castes like Dangi, Kiraar, Lodhi and what not! Many of them form large population in a constituency, even 15-20%, but groups that represent just 1-5% have the numerical strength in legislature and executive. The reason is that historically the groups that are disadvantaged, find it enormously tough to go ahead of Brahmins, Banias, Thakurs and the elite among Muslims, Sikhs, Christians or Jains. One wonders how much fragmentisation we will witness in the years to come. Dalits number around 20 crore or 200 million in India. The percentage is 16.66% in India's population. They are also referred to as Scheduled Caste or SC. As per 2011 census, population of India is 121 crore or 1.21 billion. There are Hindus, Muslims, Sikhs, Christians and Buddhists among Dalits. However, Muslim and Christian Dalits don't get reservation in jobs and admissions in educational institutes despite their belonging to SC caste. The tribal population in India is nearly 10.5 crore or 105 million. The STs percentage is 8.66% in India's population. STs mostly live in Madhya Pradesh, Chhattisgarh, Jharkhand, Orissa [Odisha], West Bengal and North Eastern states. Also, there are tribal pockets in Southern India and remaining parts of the country. Among tribals too, there are Hindus, Muslims, Christians, other communities and atheists who don't affiliate to any religion, Some worship their own God. As we have already discussed the population figures of India above, it is clear that OBCs are the biggest group. They are not Savarnas and at some places they are dominant too but educationally backward, mostly. The OBC stands for 'Other Backward Castes'. In some states, they are just called BC or Backward Castes. The number is estimated to be between 40%-52%. The need for Caste Census is to have a correct figure of all the castes and to understand their share in jobs and representation in polity. The backward castes are historically disadvantaged but some of them have strong population in certain regions. The Yadavs are strong in Uttar Pradesh and Bihar. With Muslims, they have been able to form government in both states for more than two decades now. The Jats have been a powerful community in Northern India, especially, Western UP, Haryana and parts of Rajasthan. Similarly, the Kurmis have an area of influence. As there has been no caste census in India since 1931, there is no clear picture for castes other than SC, ST. The SCs, STs are counted apart from religious minorities. But the complete caste census is not conducted. Among Upper Castes, which are also called forward castes, there are Brahmins, Kshatriyas, Banias and some other castes that are dominant or influential for centuries in different regions of the country. Most caste scientists put the figure of 'Upper Castes' at 12%. However, some say that it could vary from as low as 8% to as high as 15%. In the absence of authentic figures, the figure of 12% is agreed upon mostly. The Upper Castes have a disproportionate power in government jobs, in private sector and even in politics. In educational institutes, higher judiciary and top bureaucracy, they are often more than 50%, which is four times higher than their strength. Percent wise Brahmins are more in percentage terms in Uttarakhand, Himachal Pradesh and Uttar Pradesh. However, in UP, they form less than 8% of state's population. The Bania are even less, not even 3% in India. The last census that recorded caste population registered 4% Brahmins in India. Since then, the population of Dalits, OBCs and Tribal have increased apart from minorities. Fall in population growth rate of Brahmins, have led to assumption that they are now around 3%. Similarly, Thakurs are not too large a community but have traditional power due to their financial resources, land ownership and clanship, they are visible and wield influence. They [Brahmins] are barely 3% overall in India's vast population. The Kayasthas are not Savarna but they consider themselves as 'Upper Caste'. Some Upper Castes also consider them as Savarna, due to their disproportionately high strength in educational institutes and bureaucracy. They are more visible in cities because of jobs and hence their presence in posh colonies. But this 'job strength' aside, the Kayastha's population is not even 1% in states like UP and Bihar, which they chiefly inhabit. All over the country, they are barely a few million and less than 1% in India. Reddys are considered Upper Caste, as they are moneyed and privileged. They are over-represented in jobs and Assemblies. In Karnataka, Backward Castes like Lingayat and Vokkaliga dominate, just like Gujjars and Meenas are strong OBCs in UP-Rajasthan regions. Meenas have got ST status in some regions. The situation in Tamil Nadu is entirely different. Due to strong Dravidian movement against caste, condition of backwards and Dalits improved. Yet Bramins have more influence than their real numbers.